As someone who eats healthily ninety percent of the time I find it easier to make my own granola and muesli as a lot of shop bought cereals have added sugar, preservatives and other nasties added to them! I made this recipe up from scratch after researching loads of other recipes for granola and either not really liking the ingredients or wanting to combine recipes has led me to make my own. This granola should last about a week, though in reality it normally lasts me about four days as it is really yummy! For the granola you will need. 1 x 500g packed of mixed nuts and dried fruit. Preferably with no added preservatives or fruit sugar. 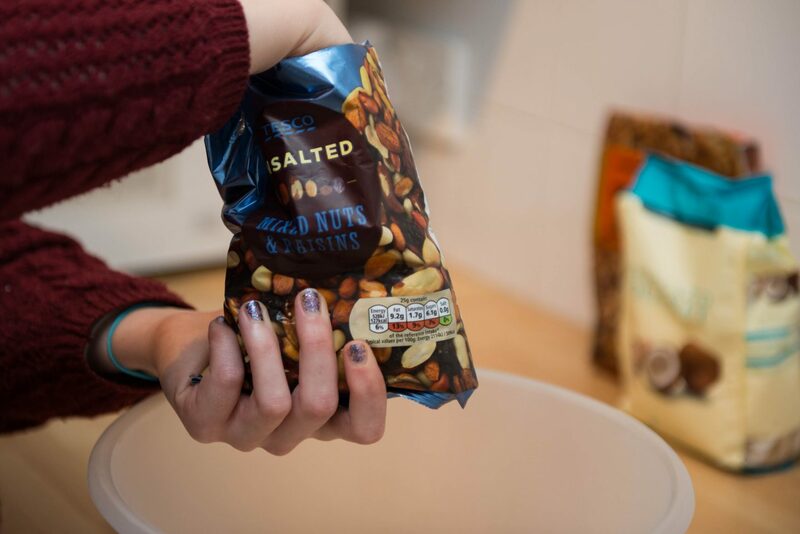 I use Tesco’s 500g packet of mixed nuts and dried fruit, you can buy your nuts and dried fruit separately, but I find it’s cheaper to buy them already pre-mixed. 1 x 200g bag of walnuts, brazil nuts or cashew nuts. This is optional. I added more nuts as I like my granola quite nutty. 4 x Heaped tablespoons of desiccated coconut. Again without any preservatives added. Coconut oil for melting to combine all the ingredients together. First all add your mixed nuts and raisins, as I have done here. P.S. This post is not sponsored by Tesco! 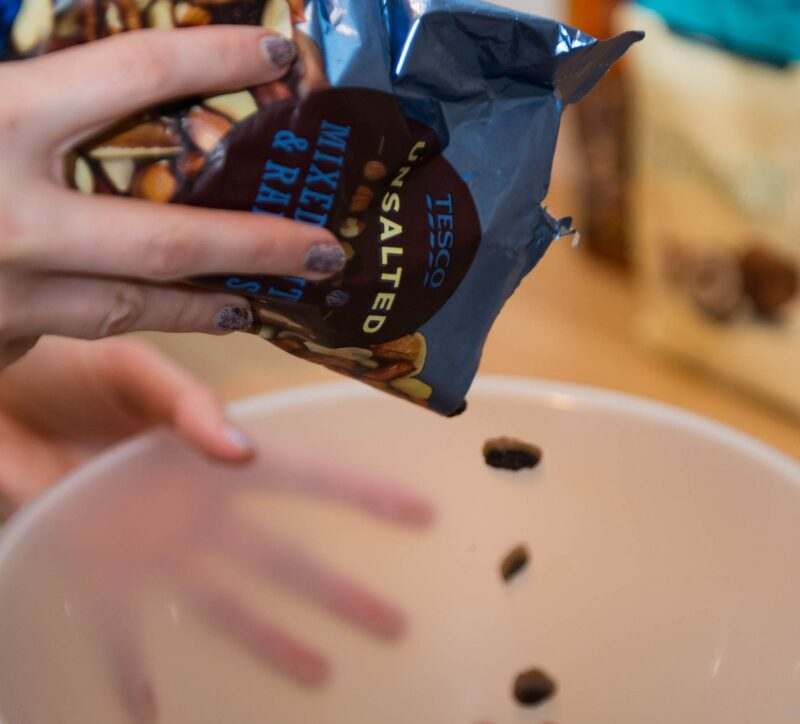 Add the mixture gradually so you don’t get one large pile in the centre of your bowl. Also pre-heat your oven to 165 degrees centigrade. Prepare a baking tray either grease-proof paper. Next add your walnuts, brazil nuts, cashew nuts etc. to the mixed nuts and dried fruit. 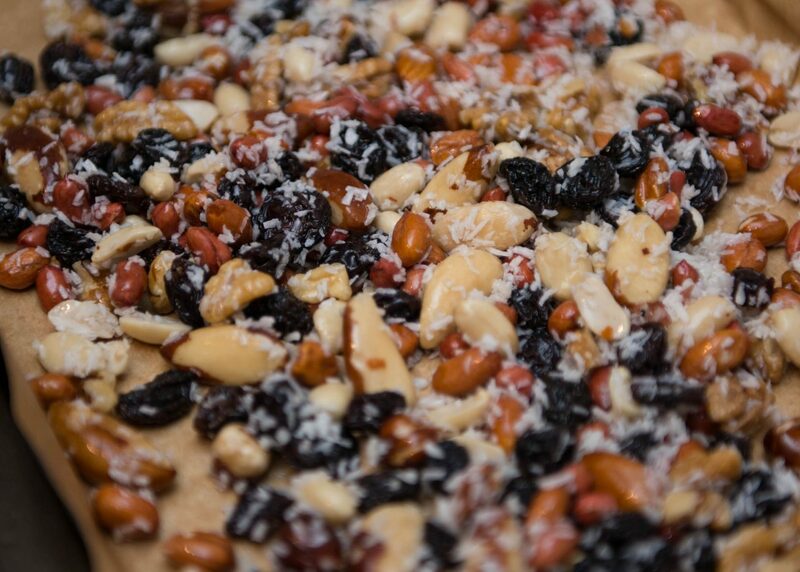 Try and keep the nuts and dried fruit as flat as possible in the blow to ensure even coating of the coconut oil. 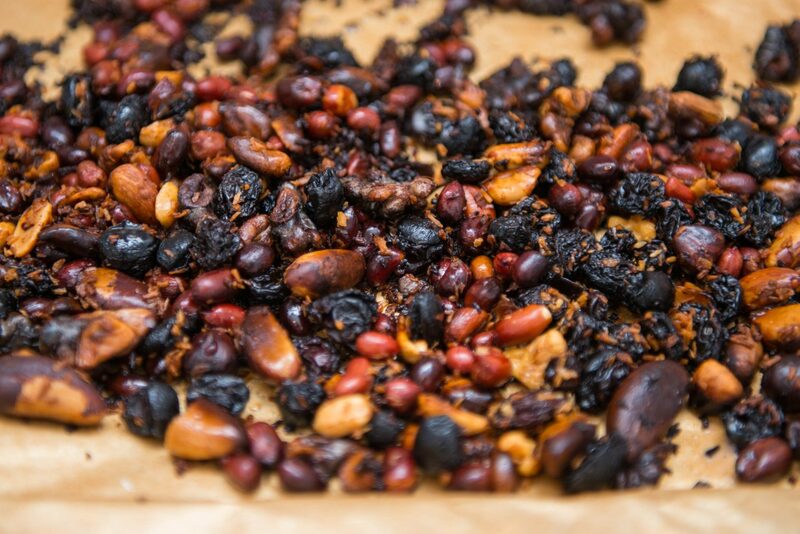 When you have added your nuts and dried fruit and stirred them together, melt seven to eight tablespoons of coconut oil on a low heat in a small saucepan. Having it melt on a low heat means that the coconut oil won’t burn as if you put it on a high heat it melts quickly and starts to burn. Now it’s time to add the dessicated coconut. The coconut gives the granola a sweetened flavour without adding any refined sugar. You could add cacao nibs or combine honey with the coconut oil if you do not like dessicated coconut. 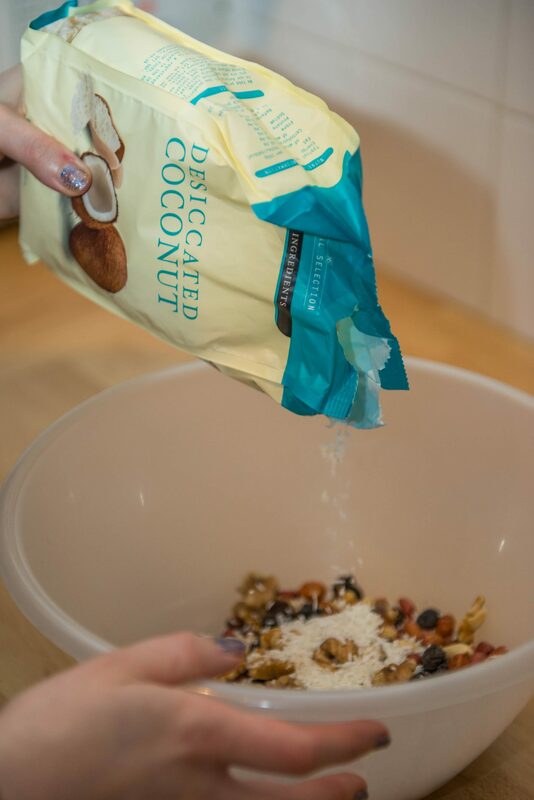 Once you’ve added all your ingredients it’s time to add the coconut oil! Make sure to give all the mixture an even cover so that they cook evenly. It’s very tempting to eat it now but it doesn’t taste very nice without being cooked! (Trust me I tried and it tasted awful without being properly cooked!). 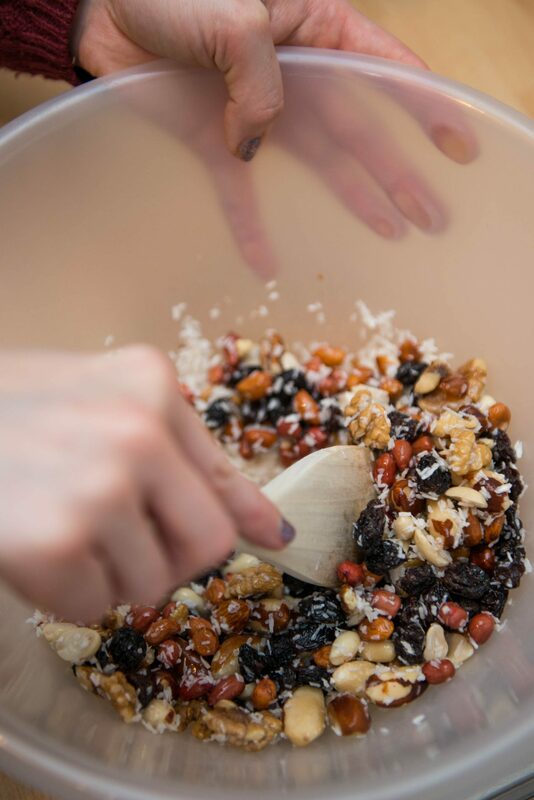 Transfer the mixture to your baking tray and spread evenly so that everything cooks evenly. 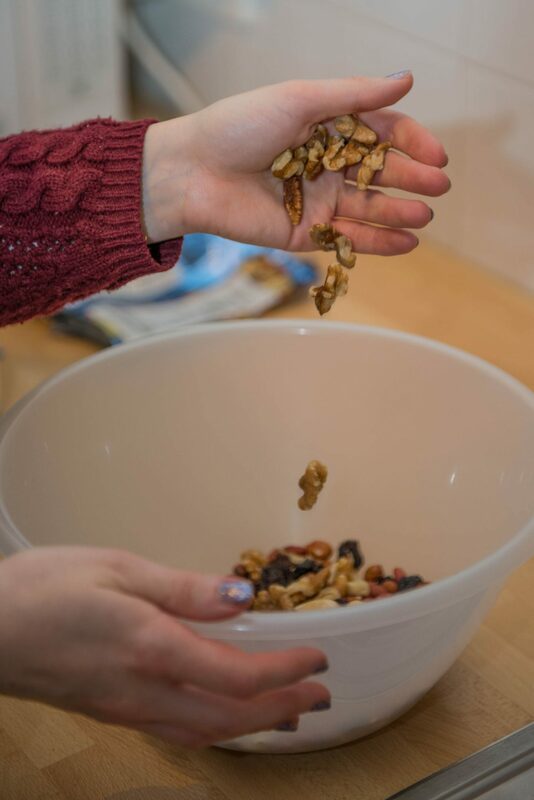 Put the mixture on your baking tray and cook for about fifteen minutes, checking every other minute so that the granola doesn’t burn! Previous Post The Saturday Supplement!